NATO defense officials and EU foreign ministers have held negotiations in Brussels over possible measures that might be taken in Libya as violence continues in the country. The European Union approved additional sanctions against Libya on Thursday, in particular freezing the funds and economic resources of five Libyan organizations. Also, an additional name has been added to the list of “26 individuals deemed responsible for the violent crackdown on the civilian population since 15 February and subject to an asset freeze." The 26 people in question include the country's leader, Muammar Gaddafi, and his five family members. They were banned from traveling to Europe and their European assets were frozen. The EU foreign ministers’ meeting paves the way for the emergency summit of EU leaders on Friday. 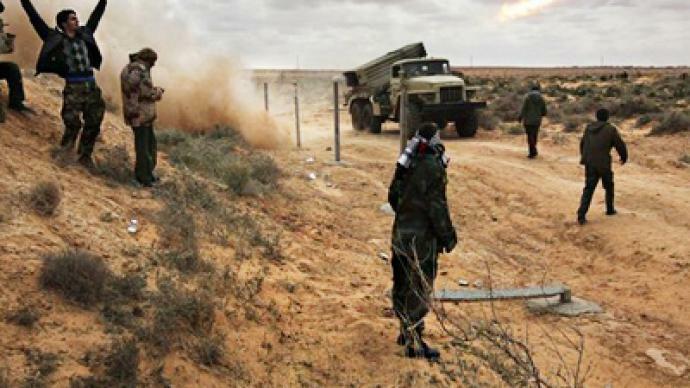 Meanwhile, in a joint letter to the president of the European Council, Herman van Rompuy and other European leaders, French President Nicolas Sarkozy and British Prime Minister David Cameron, have called for Europe to impose a no-fly zone over Libya. "It is clear to us the [Libyan] regime has lost any legitimacy that it could have," the letter said. 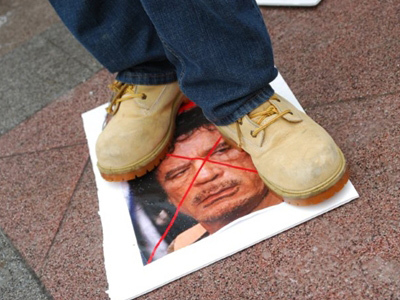 "To end the suffering of the Libyan people, Muammar Gaddafi and his clique must leave." France has become the first country to recognize rebel Libyan National Council as the “legitimate power” in the North African state. The French presidential administration made a statement after French President Nicolas Sarkozy met officials from the Libyan National Council in Paris. Sarkozy has become the first head of state to meet with the Libyan opposition. Both countries agreed to exchange ambassadors – France will send its diplomat to Benghazi and Libya’s envoy will come to France to represent there Libya officially. French Foreign Minister Alain Juppe urged European partners to engage with the new Libyan leaders. NATO defense ministers have agreed to increase their maritime presence along the Libyan coast to monitor the UN arms embargo against the country and provide support for humanitarian efforts. "Deployment of more ships to the Libyan coast would improve NATO's situational awareness and contribute to our surveillance and monitoring capability, including with regard to the arms embargo," NATO Secretary-General Anders Fogh Rasmussen said at a media briefing after the meeting. 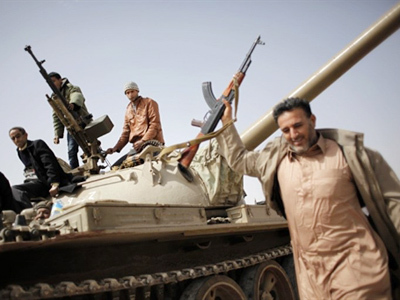 Pressure to take action has grown after the clashes between Libyan rebels and government forces in the oil town of Ras Lanuf on Wednesday evening. 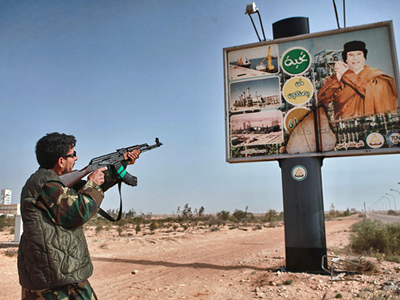 Shelling and air strikes from Colonel Gaddafi's supporters have pushed the opposition back. Nevertheless, locals are still united in their determination to keep out foreign intervention. Meanwhile, Colonel Gaddafi warned the imposition of a no-fly zone in Libyan airspace would be met with armed resistance and considered proof that the West is trying to steal the country’s oil. Gaddafi has come out very strongly saying that the Libyan people will oppose any military intervention and would rise up as one against foreign forces. He said himself that his forces would respond strongly to any such imposition of a no-fly zone, let alone any military measures. This came as he bombed oil tanks in the country. 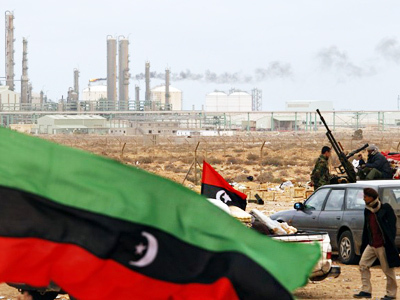 The current crisis in Libya has led to a sharp increase in oil prices, which has a damaging effect on the world economy. Russia’s envoy to NATO Dmitry Rogozin said that any accumulation of weapons and military forces in a region could lead to war. There is no common front, not only between NATO and non-NATO countries, but even within the NATO alliance. In fact there are several disagreements. Last night Britain’s Foreign Secretary William Hague admitted that opposition is hardening to the intervention of foreign forces. He said that they still need international support for any move and that international support is not there at the moment. Italy, considered one of Libya’s closest allies, last night demanded "breathing space" for the regime from international intervention after the Libyan leader sent envoys in private jets to the EU and Cairo. Italy claims Libya needs to be given time and discussions and negotiations should be exhausted before any military actions takes place. ­Jim Lobe, Washington bureau chief from Inter Press Service, does not think the French statement signifies that the military intervention has become one step closer, as he believes that at least the US does not want to invade Libya. “I would assume that [the US involvement] would be of a non-lethal nature, at least initially, and then, perhaps, of a defensive nature. I don’t think they want to be seen as fuelling the conflict, but I do think that politically they’ll want to be seen as having made an effort to protect those in the east who have risen up against Gaddafi,” said Lobe. 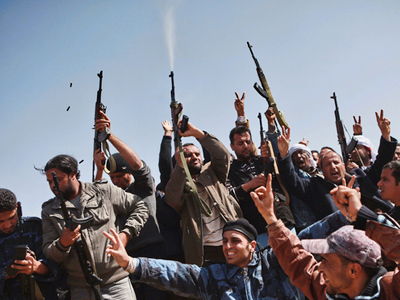 Political writer Diana Johnstone fears that what NATO is really waiting for is a little more bloodshed, so they will have an excuse to stop Gaddafi. Jean Bricmont, the author of the book "Humanitarian Imperialism: Using Human Rights to Sell War," says the Western policy of military intervention has failed. 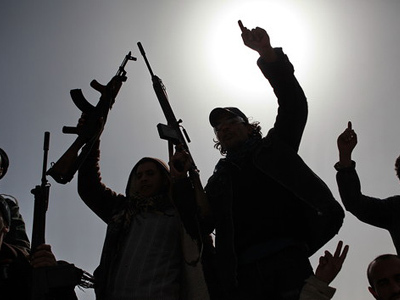 Claude Moniquet from the European Strategic Intelligence and Security Center says that by recognizing Libyan rebels, France is playing a dangerous game.